There might not be a better superhero for an open-world game than Spider-Man. Spidey brings two key elements that work extremely well for games — his job as a city-spanning crime fighter who tangles with both two-bit hoods and murder-happy supervillains; and his fast, agile movement. In Marvel’s Spider-Man, working through the story, zipping around the city, punching muggers, and catching pigeons are all compelling in their own ways. Spider-Man is a rare open-world game that feels like it supports the story and characters. In a genre that now has plenty of entries, and where games are often filled with to busywork, Spider-Man‘s activities and emphasis on freedom and travel all feel in line with the experience of being Spider-Man. 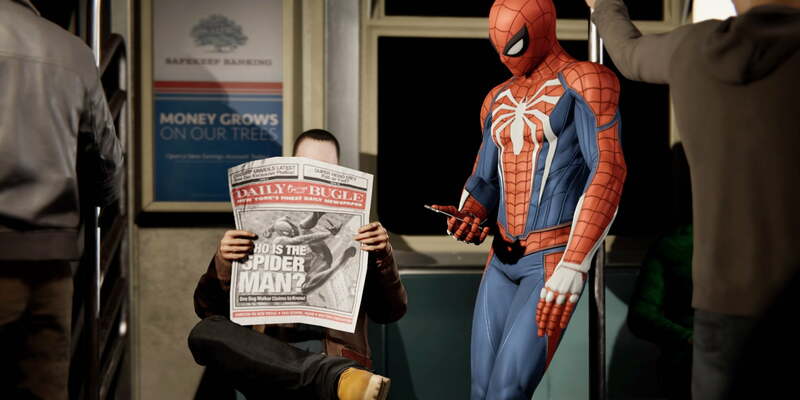 Developer Insomniac Games’ focus on tight controls, fluid movement, and a combination of slick, fun-to-deploy abilities elevates Marvel’s Spider-Man to the hallowed halls of beloved superhero games, including those past titles that starred its protagonist. It revels in the experience of playing Spider-Man, from its web-swinging to its storytelling. Spider-Man and New York always come as a pair, and Insomniac’s version of the Marvel-ified Manhattan is as much a character as Spidey himself. The game’s first moments find Spider-Man heaving himself out his apartment window and swinging through the city, and instantly it’s clear that moving through Manhattan is the focus of the game. Swinging through the city is an essential part of Spider-Man. The game nails it from the start, then improves it over time with unlockable abilities. It requires just enough strategic thinking to be interesting — you need to plan routes to make sure there are sufficiently tall structures around to hit with webs, and speed is governed by carefully timing when you start and end swings — without demanding superhuman reactions to become skilled. Getting around New York is just as much fun as wailing on bad guys or sneakily webbing a bunch of mercs before they know you’re there. Spider-Man is full of stuff to do, but the game balances its challenges to provide variety. Ambient crimes that pop up in the world for Spidey to stop, for instance, include taking out bad guys who don’t see you coming, smacking down muggers or storefront robbers, and stopping car thieves and high-speed chases. Skill-based challenges, like chasing down drones, will hone your web-slinging skills. You’ll even track down the game’s landmarks for Spider-Man to take photos, offering a reason to explore both the Marvel universe and real-life Manhattan. These tasks might feel more repetitive if not for a combat system that only gets better and better over time. Insomniac took a page from Spider-Man games past, as well as some clear inspiration from Rocksteady’s highly successful Arkham series of Batman games, to help Spidey take down whole crowds of enemies with finesse. Combat is about knocking guys out, as well as avoiding incoming attacks. At first, you’ll often mash the “square” button to punch guys while using Spider-Man’s spider-sense to dodge incoming danger. However, there’s a buffet of unlockable gadgets and moves that quickly turn combat into a game of improvisation. You can be lazy and mash counter-attacks to win in most fights, but Spider-Man is a lot more fun when you’re webbing enemies into walls, swing-kicking them off buildings, throwing them into each other, and chucking their own grenades back at them. One of the best things about Marvel’s Spider-Man is how well it’s able to wed open-world freedom with a cinematic superhero story. When Spider-Man settles into its story, it carries all the hallmarks of a great blockbuster movie. The game finds Peter Parker, aka Spider-Man, eight years into his successful career as a superhero. That means he’s no longer in high school or college, but striking out into the world on his own, and trying to find his place in it. As is usually the case, Peter is trying, and sometimes failing, to balance his obligations as protector of the city with those of his actual life. Spider-Man’s commitments make Peter chronically late and force him to bail on his friends and family, and it seemingly costs him his relationship with longtime love interest Mary-Jane Watson. The game’s open-world feel melds well with its cinematic story. The game starts with Spidey and the police taking down his organized crime nemesis, the Kingpin, which at first seems like it might end the need for a full-time Web-slinger. Suddenly, Spidey is finding himself thinking about what he might want to do with a life that’s all about not punching bad guys. He begins to think he can do more good with his Peter Parker smarts than his Spider-Man strength. Of course, those ruminations don’t last. With Fisk gone, the rogue elements his power held at bay start to grow in New York, including a new supervillain named Mister Negative and his gang of mask-wearing henchmen called Demons. Figuring out what Mister Negative is up to means punching minions, but it also includes some exciting, fast-paced boss fights with a variety of villains. There’s even a few stealth missions, in which you play as Mary-Jane, that break up the action and add a detective hook. Marvel’s Spider-Man is almost two games in this respect — it’s a strong open-world game with a lot of freedom, and it’s balanced, cinematic action game that uses a cast of well-loved, compelling characters to tell a story about how people respond to trauma and what mark they’re willing to leave. To the game’s credit, its villains (of whom there are several) aren’t especially cut and dried — while there’s plenty of baddies to beat down, the compelling key characters keep the story from devolving into a series of meaningless action sequences. Unlike many big, blockbuster games, Marvel’s Spider-Man has no online component and no micro-transactions. Instead, the game offers three downloadable story chapters together called The City That Never Sleeps. The first piece of the saga, The Heist, centers around the complicated relationship between Peter and Black Cat. Over the course of three hours, the two exchange barbs and get into numerous death-defying situations with a dangerous crime family. The Heist introduces a new large enemy carrying a ridiculous minigun that forces you to dive deep into your move set and gadgets to take him down. Once again, both the web-slinging action and story beats excel and its cliffhanger has us anxiously awaiting part two. If The Heist is any indication, each piece of story DLC will load into a new instance of New York City, complete with new crime scenes, collectibles, and challenges. Part two of The City That Never Sleeps, titled Turf Wars, releases in November, with Silver Lining on tap to finish the saga in December. Each DLC can be purchased for $ 10, or you can save five bucks by picking up The City That Never Sleeps pass for $ 25. While Marvel’s Spider-Man occasionally bogs down in the weaker parts of the open-world genre — some of the upgrade systems funnel you into completing a ton of open-world activities, and those activities can get repetitive — it’s a phenomenal effort and a strong realization of what people like about big open places they can explore at their own pace. Spider-Man’s character even makes side-quests feel natural. He’s known for stopping muggings, saving pet pigeons, and fighting a villain who can level a building – all in a day’s work. Marvel’s Spider-Man brings it all together in a package that perfectly captures what it’s like to be Spider-Man, from climbing on walls to struggling with personal relationships. It deserves to swing its way into the annals of great, beloved superhero games. In the realm of open-world games, Marvel’s Spider-Man is one of the rare entries that doesn’t feel overfull, overlong, or wasteful. You’d be hard-pressed to find a stronger entry in the genre, and it’s a great superhero game to boot — only Rocksteady’s Arkham series comes to mind as a strong alternative. The main story campaign can pass by quickly for dedicated players — we finished it in around 12 hours — but the extra open-world content can take as long as twice that to finish. The Heist story DLC adds about three hours to the adventure, and two more mini-campaigns will round out The City That Never Sleeps. Insomniac also has downloadable content planned that will further extend the hour count. Absolutely. Whether a fan of Spider-Man himself, the open-world genre, or action games in general, Marvel’s Spider-Man is an excellent example of each.